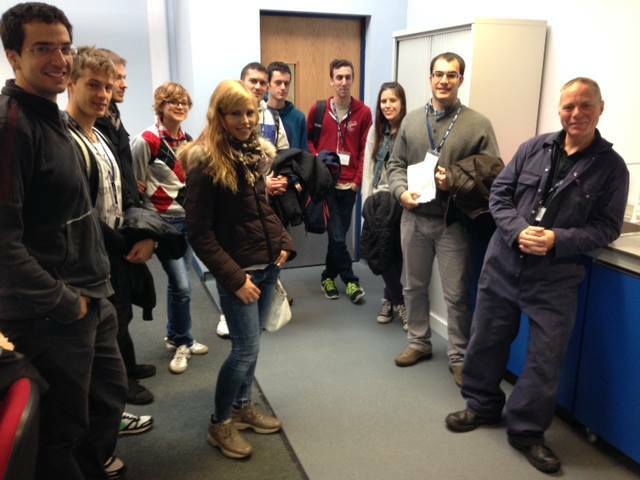 University of Nottingham > Blogs > INNOVATE - Novel Aerospace Technologies > Aerospace > Who said that doing a PhD course is a completely individual study? What kind of image appears in your mind when you think of a PhD student? I experienced the first 6 months of a PhD course in Italy before moving here to join the INNOVATE project (a multi-disciplinary team of 13 early career researchers studying for their PhD). When I was in Italy and I said to somebody “I’m a PhD student”, it was clear that people imagined me sitting on a chair, behind my desk, with my laptop, doing calculations, spending all the day alone…let’s say, as a kind of NERD! But this is my opportunity to demonstrate that a PhD course can be a much more dynamic work environment! The whole INNOVATE team and ‘Mr. Andy’ (the Aerospace Technology Centre technician) after the balsa aircraft competition. I’m still a PhD student now, but not in the same way that I was in Italy, where I worked exclusively on an individual project: now I’m in the INNOVATE Team! There are 13 guys in the team (well, 10 guys and 3 girls) and we are all PhD students, but let me say that we are all very different! Each member has a different academic background but we were chosen to work together on a multi-disciplinary aircraft demonstrator. My own academic background is in electrical engineering, and back in Italy my research activity was focused on finding numerical tools to optimize the operations for producing energy from a smart grid system. However, here my role in the project is to build an electrical motor for the green taxiing operations (but we have time to investigate this topic in some future posts, now I don’t want to bore you with that). Maybe you are wondering why I left one PhD course for another one? It could seem pointless, but when I discovered that the INNOVATE project is based around doing research in a group I had the feeling this was the right choice. When a friend of mine came and told me about this kind of project, it was so fascinating! It seemed to me that it was a sort of mission: they were selecting people able to complete the job in 3 years! So challenging! INNOVATE is a project where there’s no chance to study only “for yourself”: all the work that you are doing is necessary for the team. You always have the possibility to see how your own research contributes to the overall project and what your work is useful for. Doing a PhD in a team means being motivated every day, learning a lot of new things from your teammates, and then working together to find the best solution. 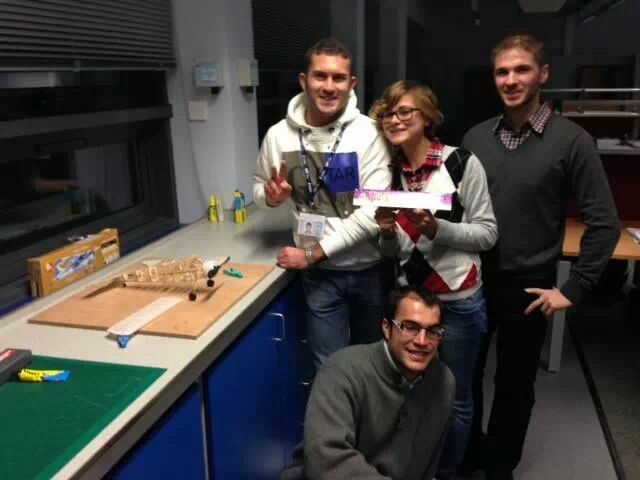 Our first challenge, during the first week at the University, was to build a balsa aircraft. We were divided into three teams (each one led by a girl of course! ), and it was the coolest way to get to know each other and to start to understand how it is to work in a team, with the “good” feeling of competition. 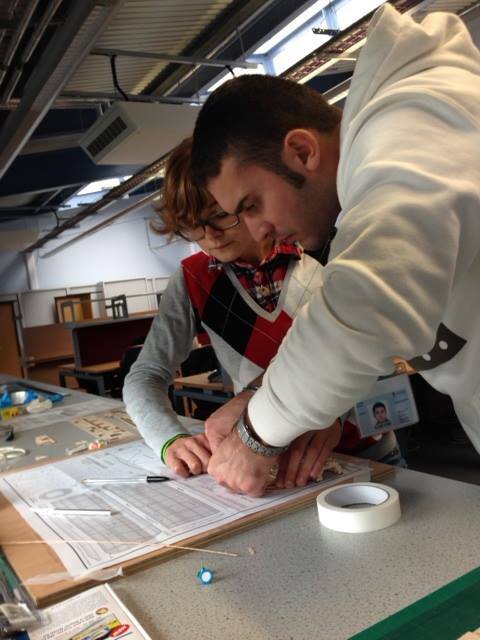 My team on the first day of the balsa aircraft competition: Alessio, Chris, Luca. I won a massive chocolate bar for being the fastest in building the airframe. Now, we are trying to make two UAVs (Unmanned Aerial Vehicles) fly! It is true that it is not always easy working in cooperation, particularly when things don’t work properly and you feel the pressure of deadlines. But on the INNOVATE project you can always rely on the support of the whole team…and what more than that can you ask for?